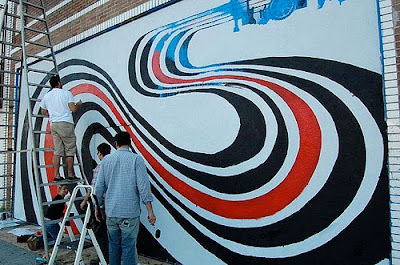 This mural in the Silver Lake neighborhood of LA was the recognizable backdrop for the cover of the 2000 Elliott Smith album Figure 8. 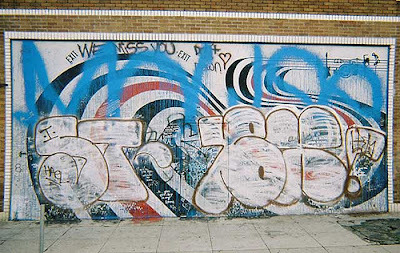 After becoming a sort of shrine following his death in 2003, with tasteful fan graffiti and notes scrawled on the wall, stupid taggers decided to mess it all up. And no one cared. Enter the impassioned fans, and the subsequent restoration. Read the full story over at Sly Oyster and download a 1997 set from Elliott on Morning Becomes Eclectic. I always enjoy hearing Elliott Smith news. I think I started listening to him in college, I still slip in one of his CDs from time to time. Good stuff. Hello Heather: It's been way too long since I listened to "Figure 8." Thank you for reminding me. I'm linking you. Hope that's okay. See you around. Radio Guy: Why are you leaving Portland? E. Smith: Well, I lost my band, and I'm not going out with my girlfriend anymore, so I figure it's time to leave town. Radio Guy: I'm really striking out with my questions. E. Smith: I'm gonna cheer up in a minute.